In 1933, publishers at Eastern Color Press were trying to think of how to better use their printing equipment which frequently idle between jobs. Maxwell Gaines (father of William F. Gaines, EC & Mad publisher) came up with the idea of printing an 8 page comic section that could be folded down from the large broadsheet to a smaller 9 inch by 12 inch format. The result was the first modern comic book. 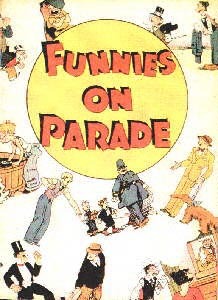 Containing reprints of newspaper comic strips, this experimental "comic book called "Funnies on Parade" was given away for free and proved that there was a market for repackaged strips. The following year Eastern published "Famous Funnies" (series 1, the fifth comic book) and took the bold action of selling the comic for a whopping ten cents through chain stores. So successful was the book that Eastern began producing numerous reprints on a monthly basis and other publishers, eager to capture profits jumped on the bandwagon. One of these publishers, National Periodicals chimed in with their first effort in February 1935. This title, New Fun Comics was just as it's name intimated - and entirely new content book, devoid of reprints and with original characters that appeared from one issue to the next. It was the first example of the modern day comic book. Often crudely drawn and badly written, the novelty of comic books did not tail off and more books were printed each month by a growing list of publishers. As a new medium, there had really been no pre-set boundaries for the style or story lines so there was constant experimentation, new genres were played with, and finally ideas began to gel for the comics. In 1938 Harry Donenfeld, the publisher of National Periodicals was looking for a new headline feature for his soon to be published Action Comics. Again Max Gaines was to be involved in another trend setting innovation. Six years earlier two teenagers in Cleveland, avid readers of Amazing Stories, had read a Phillip Wylie novel titled "Gladiator" about a more than human man with super strength and other enhanced powers. Inspired by this story the two young men, Jerry Siegel and Joe Shuster created and wrote a story called "the Superman of Metropolis" and published it in their own fanzine publication Science Fiction, which also featured such popular fan names as Ray Bradbury and Forrest J.Ackerman. Buoyed by a favorable response from other fans who read their story, the two boys wrote and drew an entire episode of daily strips which they submitted to syndicate after syndicate.